If I knew this was so easy and tasty, I would have been doing this years ago. I am not kidding this tastes way better than the packaged stuff. It has the right amount of pleasant sweetness. Unlike the packaged oatmeal it does not leave a heavy laden coat of sugar that sticks to your tongue. And the fresh ingredients are filling, satisfying and energizing. Oatmeal is rich in antioxidants, vitamins, and minerals but, most importantly, fiber. I placed the oatmeal in the bowl, sprinkled in the chia seeds. Then I chopped up the walnuts and the apple and added them to the bowl. Poured in about 3/4 cups of water and heated it in the microwave for a minute and a half. After it was cooked I drizzled the honey on top. These are my favorite ingredients for this, but you can play around with other fine foods, like berries, pecans, etc. Maybe you like flaxseed or sunflower seeds better. Sweeteners, like coconut sugar, or agave nectar would also be a nice touch. And you can play around with the measurements. Overnight Oatmeal. 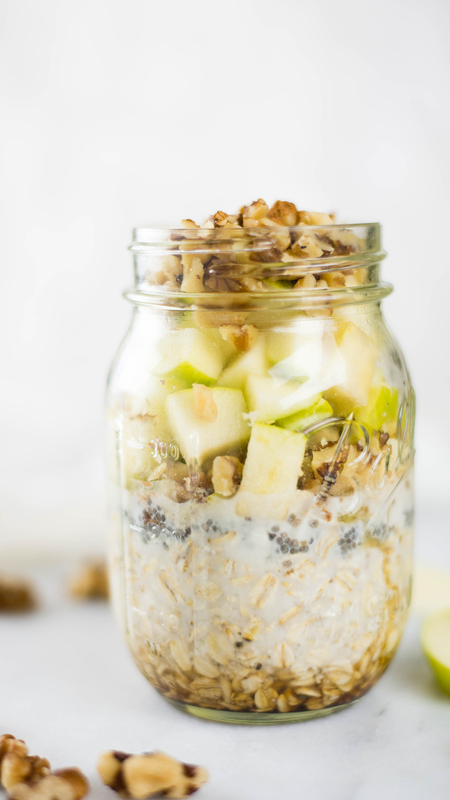 If you would like to have it prepared to go in the morning add all the ingredients in a mason jar. I prefer almond milk. Cover and refrigerate for six hours. Please comment below and tell me what do you think you would put in your oatmeal creation? Get ready to be fit and take back your power from the damaging diet industry! Click for a free copy of Tips For a Happy Holiday Belly and learn more about my unique approach to health coaching at lynnecampanaro.com. Are you interested in becoming an Integrative Nutrition Health Coach and starting a career you’ve always dreamed of? Click here to learn more! Thank you and be sure to pass this recipe on to someone you care about! Yum! Yes, I will try. Thank you. Thank you. Yum! Yes, I will have to try. Thank you. Thank you. Tried it! Except, I exchanged apple for dried cranberries. Thank you. Great, fresh breakfast.